The boys lacrosse team sprints across the gym during the conditioning part of tryouts. As soon as their tryouts finished, the baseball team was quick to take the court. “With such a tight schedule, it was important to get on the court as soon as softball finished. We were rushed off right at six so baseball could start,” said Sulin ‘19. With a new turf field on the way, the problems caused by a lack of outdoor field space finally have a solution. Despite the step forward, another issue is still looming; a lack of court space. With snow still covering the fields and the spring sports seasons officially underway, the teams are finding it difficult to balance court space between baseball, softball, boys volleyball, and boys and girls lacrosse. The issue became apparent when the baseball and softball teams began having training sessions in the gym after school, with the two combining to occupy the gym from 3pm to 7pm, Monday through Friday. This time slot left the volleyball team and lacrosse teams without a place to practice, until 7pm, which isn’t ideal for balancing a student’s academic workload. Because of this, the lacrosse team resorted to training sessions on the weekends at the Hampshire Hills Dome, a place with heavy fees to reserve field space. “I wish we could practice in the gym,” said, lacrosse player, Connor Farwell ‘19. He doesn’t mind practicing at the dome, but admits it would’ve been more convenient to be able to get a couple training sessions on the court after school. “We get weight room sessions three days a week, but it’s different from actually training. I wish we could practice in the gym,” said Farwell. The volleyball team has been particularly annoyed by the lack of space, because they actually use the gym for the season. 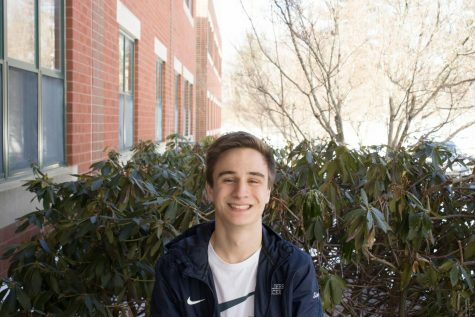 Michael Moscatelli ‘19 doesn’t understand why they don’t have priority over court use, considering they use the gym for their games, and are the only indoor spring team. “At the end of the day, it is what it is. We understand we have to share the gym, but it puts us in a tough spot considering we’ll only have a couple real practices before our first game,” said Moscatelli. The volleyball team is essentially a week behind their competition in terms of practice time, because they have have to wait until the other tryouts have finished before they can tryout themselves. As for preparation for the season, Moscatelli noted how not having multiple weekly training sessions was okay, as it allowed for athletes to recover from the arduous winter season. 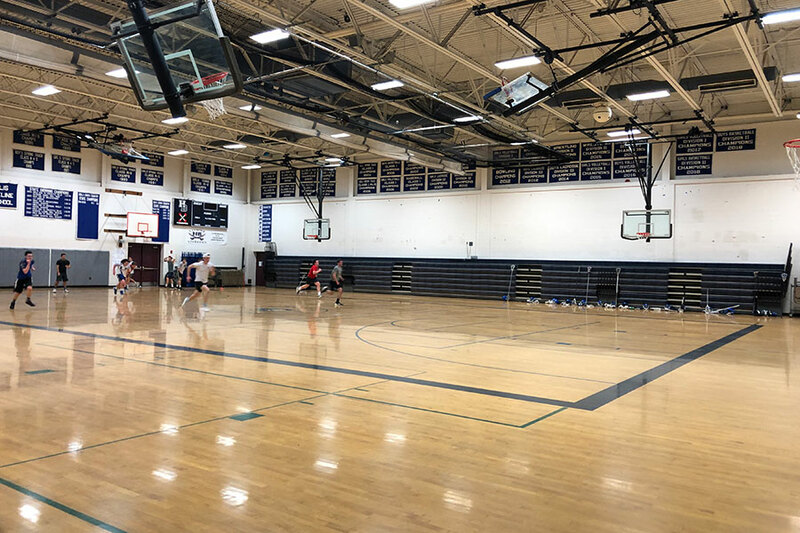 The boys lacrosse team has previously had its tryouts on the parking lot, which is not an ideal location for showcasing their talents, so they joined the other teams in playing in the gym. “The ball rolls significantly faster on the pavement, and you slide on the sand so you can’t play at full strength because you don’t want to injure yourself,” said Tim Sulin ‘19. The pavement is not only hard, but also slanted downwards, creating an uneven playing surface. Unfortunately, the boys moving into the gym forced the girls team out. Girls varsity had their tryouts at the Hampshire Dome, which with a turf field provides an ideal surface to play on, but with the downside of a hefty price tag. The tryouts were funded by the parents, which is a flawed process considering parents are paying for their children to tryout on varsity for a chance they don’t even make the team. In order to accommodate for the number of athletes trying out, the teams are taking advantage of the mini gym for some extra space. The mini gym provides more issues and some safety concerns, given how small of an area it is. Playing lacrosse in a small gym can lead to balls bouncing off the walls and could potentially injure coaches or players on the sideline. “In the past the coaches have worn helmets, because a ricocheting lax ball could seriously injure someone,” said Sulin. The school and athletic department have done their best to fit every team on the court, and managed to run tryouts smoothly. The turf field, which will be able to be used in the winter, should solve the issue for the future, but in the meantime the gym will remain crowded.